According to reports, J.J. Abrams is directing Star Wars Episode VII. Yup, the Star Trek director is heading to a galaxy far, far away. We'll leave the debating over whether this is a good choice up to you. But for collectors, it looks as though autograph cards (yes, there's more than one) of the well-respected filmmaker could be headed for new heights. Besides rebooting the Star Trek franchise, Abrams and his company, Bad Robot, have been responsible for TV shows LOST, Fringe and Alias, all three of which have had popular trading card series. He has also directed Mission Impossible III and Super 8. 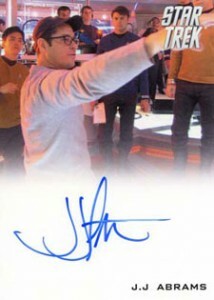 Collectors have a pair of J.J. Abrams autograph cards to look for. His signature in 2009 Rittenhouse Star Trek Movie (based on the reboot) is one of the set's rarest. As a result, it has been trading for $150 to $300 since its release. Star Trek card collectors are very passionate and set collectors helped drive sales. Plus, the film was a huge hit. The combination of time and rarity have made this card tough to find today as many now reside in personal collections. Easier to find is the first J.J. Abrams autograph card, which can be found in 2002 Inkworks Alias Season 1. Just a few years ago, this card could be found for under $30. But Abrams' rise in popularity has caused prices to climb steadily. Now, they're approaching $100. And that was before he was confirmed to be working on Star Wars Episode VII. While there was little doubt before, J.J. Abrams is one of the, if not the, most high-profile filmmakers in Hollywood in a long time. The connections to Steven Spielberg should be even closer now. Collectors who love Abrams' work may want to jump in while they still can as far as his autograph cards go. He's connected to the two biggest science fiction franchises of all-time. Both also have the most passionate followings in entertainment cards. There's only one direction his cards will likely go, and that's to the stars. A J.J. Abrams auto card is definitely my sole priority at San Deigo Comic Con this summer… hopefully it won’t be too late for the prices to jump. Do you think we’ll see much more J.J. cards in a potential Star Trek 2 box + Episode VII trading cards? If so, should we wait? Andrew Baik � Rittenhouse hasn’t announced any formal plans for ST2 that I’ve seen. So maybe. As far as Episode VII goes, that’s still a long ways away. A lot could happen between now and then. J.J. Abrams Alias Season 1 Autograph Card Certified Auto #A2 STAR WARS RARE!